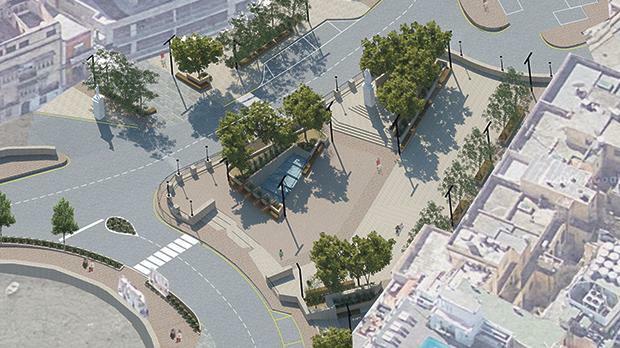 Infrastructure Malta has scrapped plans by the St Julian’s council to embellish Spinola Square and has begun its own project which it aims to complete by summer. The roads agency said the council’s plans would have created more traffic and congestion so it decided to go ahead with its own project, which it hopes will improve traffic flow. The plan supersedes the project discussed and approved by the council which aimed to create more open space and to pedestrianise a substantial part of the square where double parking is the order of the day. But the Infrastructure Malta plan did away with the pedestrianisation and instead created an upgrade to the junction which it says would improve safety and efficiency. A spokesman for the agency said that the Spinola junction was a crucial node of the Maltese road network, connecting the main north to south arterial route. The current layout of this junction is not only causing unnecessary travel time delays, but is also a major accident risk due to several unsafe road crossings, he added. “Through the ongoing upgrade, which will be completed before summer 2019, the traffic capacity and efficiency at this intersection is being increased to reduce travel times to and from different nearby residential and entertainment areas, including St Julian’s, Paceville and Sliema. An artist's impression of the council's proposed Spinola project. “This project also forms part of the preparations for a more extensive long-term plan that Infrastructure Malta is preparing for the Madliena, Pembroke, Swieqi, St Julian’s, Paceville and the Sliema conurbation’s road network, and which also includes the upgrading of Triq Sant’ Andrija along the TEN-T route. Details of these plans will be announced soon,” the spokesman said. The project will also see several underground network upgrades requested by the utilities, improvements to the area’s storm water systems as well as safer bus lay-bys for easier access to the public transport service and the re-organisation of parking bays. The spokesman said that the project was discussed with the local council but at no point was the council’s pedestrianisation proposal ever mentioned. “While the local council had long been aware of Infrastructure Malta’s plans, it failed to inform the agency about its proposals before its plans were presented to the Planning Authority,” the spokesman said when asked to explain why the council’s proposal had been trashed. According to the agency’s road planners, the council’s proposal would have had a devastating effect on the road network, with the overspill onto adjoining neighbourhoods and an adverse traffic impact. Efforts to contact St Julian’s mayor Guido Dalli proved futile. 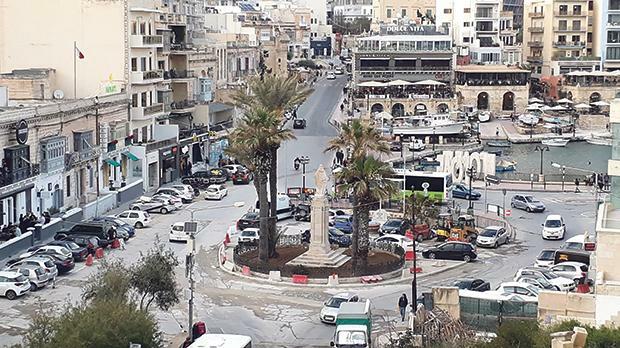 According to Infrastructure Malta’s plans obtained by the Times of Malta, drivers would need to go around the Sacred Heart roundabout, one side of which will become a parking area for nine cars. Drivers coming from Balluta will have to turn down and go around the Sacred Heart monument if they want to keep driving up towards Paceville. The road near Tex Mex will become one-way going down while the parking areas in front of the St Julian’s police station and adjacent restaurants will be removed.